Deep fryer fires cause death, injuries and more than $15 million in property damage every year. According to the National Fire Protection Association: deep fryer fires cause an average of 5 deaths, 60 injuries and more than $15 million in property damage each year. Deep-frying turkeys has become increasingly popular, but the new tradition is a recipe for holiday tragedy. As the turkey is placed in the hot oil, oil may spill from the fryer onto the burner, causing a fire. Turkey fryers can easily tip over, spilling the hot oil onto anyone nearby. Most turkey fryers do not have an automatic thermostat control. Because of this, the oil can overheat to the point of combustion and cause a fire. Turkey fryers, including the lid and handles, get extremely hot and can easily cause burns. Partially frozen turkeys placed into the fryer can cause a spillover effect. 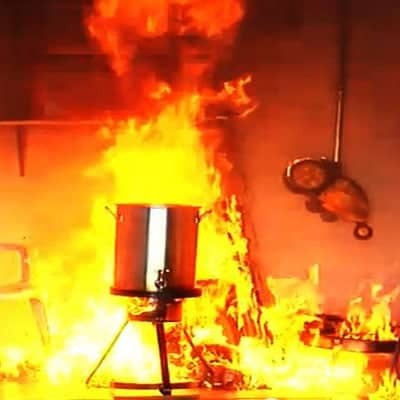 Underwriter Laboratories, one of the country’s top safety consulting companies, has decided not to safety certify any turkey fryers because of the increasing number of fires and burn injuries related to their use. Make sure to use the fryer outdoors and use the fryer a safe distance from flammable materials and other buildings. Do not use turkey fryers in a garage. Never let children near the fryer, even when it’s not in use. Use safety goggles to protect your eyes and always use pot holders or oven mitts when handling the fryer. Keep a fire extinguisher near the fryer. Do NOT use water to put out a grease fire.